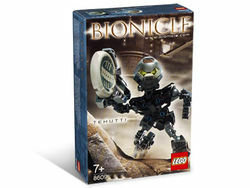 8609 Tehutti is a BIONICLE set released in 2004. It contains Tehutti, an Onu-Matoran. This is a description taken from LEGO.com. Please do not modify it. (see an archive of the product's page) Seeker of lost treasure in Onu-Metru! In the time before time, Metru Nui, city of legends, faces danger unlike any it has known before. A mysterious and powerful menace threatens the city, striking from the shadows and then disappearing, leaving rubble in its wake. Six Matoran hold the keys to its defeat, but they have disappeared! Worse, one of them has been touched by darkness and plots against all of Metru Nui. Tehutti has worked in the Onu-Metru Archives for years, and dreams of finding a treasure that will bring him fame and fortune. But will his dream bring danger to the city of Metru Nui? Includes disk launching action and collectible Kanoka disk. Seeker of lost treasure in Onu-Metru! In the time before time, Metru Nui, city of legends, faces danger unlike any it has known before. A mysterious and powerful menace threatens the city, striking from the shadows and then disappearing, leaving rubble in its wake. Six Matoran hold the keys to its defeat, but they have disappeared! Worse, one of them has been touched by darkness and plots against all of Metru Nui. Tehutti has worked in the Onu-Metru Archives for years, and dreams of finding a treasure that will bring him fame and fortune. But will his dream bring danger to the city of Metru Nui? Includes disk launching action and collectible Kanoka disk. This page was last edited on 30 November 2016, at 01:53.